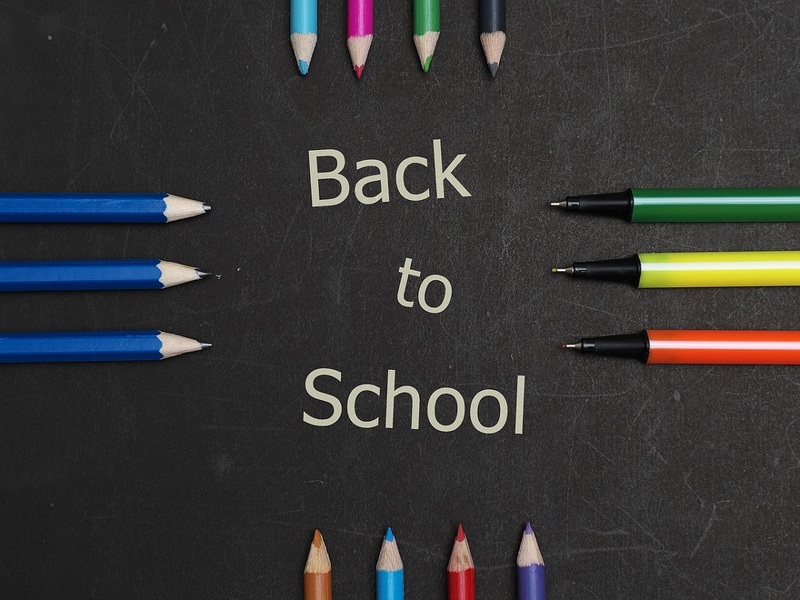 Whether you have a first time new school starter (sob), or you’re getting ready to send the little angels back at the end of a long six weeks (someone pass the wine), we’ve got a handy survival guide to the back to school period for families. School logo items aside, we’re spoilt for choice now when it comes to picking up uniform. Generally speaking you do get what you pay for. We’ve bought the cheaper supermarket items before, and from a price point you can’t argue with them (and once they start coming home with ink and pen stains you’ll be glad of cheaper replacements), but I do think after a few washes they can start to look a bit tired. Most places do uniform now, personally we’ve started buying from Next and love their school shirts and girls summer dresses which are super easy to iron and keep clean. Another favourite is M&S who do a great range of uniform and coats, and they also do free delivery on school uniform. Click here to shop now. **Top Tip** With the pinafore dresses and summer dresses for girls it may be a good idea to consider ones with a front zip rather than buttons, especially when they first start. It makes things a lot easier when they have to change themselves for PE lessons, some of those buttons can be very fiddly. We always find John Lewis a great place to go for school shoes. It can definitely seem like a big expense but we’ve always found the shoes last and we haven’t had to replace them apart from a change of size, our daughters shoes just lasted the whole school year. They sell their own brand, Clarks, Start-rite, Lelli Kelly and more, so there’s a great selection of shoes and prices too. To have a look at the range and order online, click here. John Lewis do a children’s shoe fitting service which you can even make an appointment for, meaning no waiting around in long back to school queues with bored children (been there, regretted that!) You can make an appointment here. **Top Tip** Did you know that up to the age of 4 your children’s feet can grow two whole sizes in a year. By the time they start school this will usually (thankfully) slow to one size a year. Another useful thing to know is John Lewis do a home shoe size checker so you can keep an eye on their growth spurts and make sure they’re in the right size without always having to pop to the high street. Winner! Find out more here. Don’t forget… gym plimsolls. You’ll find most high street retailers do these now and there’s no need to pay above the odds for these. We got ours from Matalan for about £3.00. If your children will be taking a packed lunch in when they go back to school then you’ll need a lunchbox to send in with them. My little ones are Smiggle obsessed and even I’m tempted to pick up bits for myself when we walk through the door! They have some great lunchboxes with loads of options when it comes to colour, design and layout. We love the double decker ones with different compartments and a great wipe clean inside. Click here to have a look at the Smiggle range. Another thing worth looking at are the Sistema cube boxes – great for packing food in different compartments and so saving on using things like cling film and sandwich bags. Shop the range here on Amazon. Water bottles are a must to keep kiddies hydrated throughout the day. We’ve tried loads of different brands and styles and our current favourite is the Smiggle super silicone roll bottle. Again they come in loads of colours and funky patterns and they’re super lightweight too. The best bit is when they’re empty they can be rolled up to save space in those school bags. Click here to order now. **Top Tip** Children in England get free school lunches in Reception, Year 1 and Year 2 so to save some pennies it’s worth encouraging them to have school meals. I find it great to know they’ve had a hot meal during the day too, so easier to have something quick in the evenings, giving you back some family time. A lovely way to celebrate and remember a first day at school. A personalised photo frame lets you put that adorable first day photo on display in your home, and they look fantastic too. Have a look at some great options on Etsy here. I remember being obsessed with collecting keyrings when I was younger and I’m glad to see they’re still just as popular with children now. A nice way to personalise school book bags which can help to identify their bag at the end of the day, Smiggle have a great collection with initials, characters and much more. Have a look at what’s on offer here. We love these as they’re a great thing to treasure and capture dates, names, school details, dreams and more. They can be totally personalised for your child and also look great displayed on a wall. Click here to have a look and get yours now. A nice way to celebrate the start of school and help get them excited about going in is with a personalised school bag. There are some lovely options out there, Etsy has some great choices. And if you’re not one for putting their name on the bag for safety reasons then you could just use their initials. Click here to have a look at school bags. Stamptastic – a revolution in the labelling of children’s school items, these stamps have your child’s name on them and you simply stamp it in clothes, on metal, wood and some plastics. Genius. Click here to find out more. M&S have a great system for parents looking for ease and speed whereby you can order name tags for clothes and shoes by a simple text message charged to your phone. You can get iron on, sew in and even special labels for shoes. Click here to find out more. Nametape Express – we use these and they’ve been a godsend. They are small stick in labels which stick easily and quickly to pretty much anything! No need to get the iron or the sewing kit out either. They even stick to their water bottles and packed lunch boxes. We get them from Amazon, click here to get yours. John Lewis do the complete range of name labels from iron on to sew in, and small vinyl labels. To get yours now, click here. Who doesn’t love a well packed pencil case?! I still have one now, and apologies if I sound like I work for Smiggle (I don’t, honest), but you won’t go far wrong with having a look on their site to get your bits and pieces ready to send the little ones back to school in September. From sequin clad pencil cases to coconut scented pencils, it’s all there. You’ll often find discounts online too, to have a shop now see pencil cases and stationery. We hope you found this back to school post useful. For ideas on days out for families in the UK, click here.